Exclusive! South-of-the-border style! 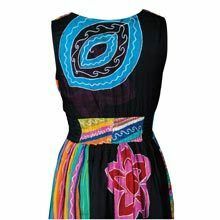 Full, three-tiered Colorful Tiered Fiesta Dress features a festive patchwork print, smocked elastic at back, and crossover bodice neckline. Easy pullover styling adds comfort and flair. Woven cotton. Machine wash. Imported. Misses, approx. 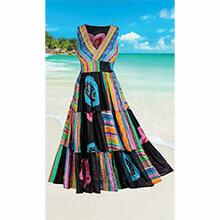 52"l.
Just wearing this colorful dress puts me in a good mood. Fits well .... Love it.